This campaign objective will attract investments that drive economic growth — by increasing patent production, technology transfer, and industry collaboration. The campaign will invest in in our inventors. It will launch new public-private partnerships, attract pooled consortium support for research, and interest venture philanthropists and outside investors in moving early-stage discoveries and new technologies into private development and the marketplace. This campaign objective will also support StartUP FIU, the business accelerator for our university and the community. Investment in StartUP FIU’s vigorous platform will give faculty the knowhow and connections they need to derive commercial value from their research. And it will build StartUP FIU’s capacity to help more great ideas, innovations, and companies scale and make lives better. 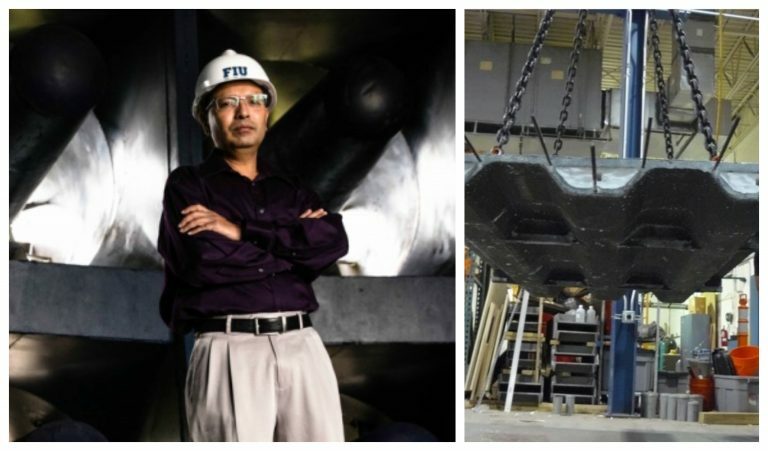 Professor Arindam Gan Chowdhury has patented a hurricane-resisted concrete roofing-panel system.